This is what the end of a typical good evening looks like – shoes off, waiting for a taxi home, if your head will fit in the car, that is. Of all the people I took photos of that night, this is the only beautiful creature whose name I didn’t get. If you know who it is, please leave a comment. I caught her as I was walking home. “That night” I refer to was RED, a fundraising gala by Positive Living BC in support of people living with HIV, held at Harbour Event Centre on May 13 with the assistance of a myriad of generous sponsors, volunteers, and auction donors. The theme of this year’s event was “A Positive Day in Vegas.” In this case, the adage, “What happens in Vegas, stays in Vegas,” definitely can’t apply. Tongues will be wagging about this incredible showcase of talent, care, and generosity for months to come, which was carried off under the helm of the MC Conni Smudge, who is described on her website as Canada’s own Dame Edna. Most importantly, as a result of RED, those living with HIV will benefit directly from extra funding, much needed with government cutbacks digging into an already-limited supply of assistance. Above, Conni Smudge. I’m sorry I’m sorry!! – this is definitely not the best photo, but you can still see her dazzling sequined outfit. I enjoyed her flashing (or threatening to flash) people sitting in the front rows. Go to her website here for photos that do her justice. Below, Lexus Jade, a supporter from the audience. I fell in love with her towering head wrap. Over 100 models/actors/dancers strutted, kicked, high-stepped, and sashayed their stuff down the runway, from a live fire act to a lighted hula-hoop performer, show tunes to hip hop. The action was non-stop. Would you believe I arrived around 7 p.m. for the cocktail hour and didn’t leave until just after 11:30 when the show ended? No wonder Madam Unknown in the first photo had removed her shoes. Much of the time I was riveted to my seat, but I did manage to wander around and snap a few pics of other attendees during breaks. I would have liked runway shots but my seat was not very close to the stage and I would have obstructed the views of people behind me if I tried. But the audience was a whole show unto itself. I sat near this man, Nick, above, for most of the evening. His daughter, Donia Kash (Instagram here), was a featured dancer in one of the numbers – so talented! 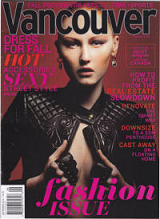 Nick said that he has been involved in Vancouver Fashion Week since its founding. Too bad I didn’t get a shot of his beautiful, boldly-striped socks. Love that honeycomb pattern of his shirt. Below: Members of the burlesque troupe, Bonerattle Burlesque (from Bonerattle Talent), which also performed later. Left to right: Teresa Mari, Dezi Raider, Lottie Libido, Roe Butts. Below: Michele and Peekaboo North. I may be mistaken, but I think I caught Madam Peekaboo fondling a huge hunk of cheese from a cheese wheel later in the evening. Below: The fantastic, excellent, outstanding (insert more superlatives here) auctioneer for the evening, Mr. David C. Jones. Sorry, David, this was the best shot I got, but you still look oh so fine. Below: Tanya Paz, connoisseur of vintage. Her Instagram is here. I sat near her as well. I love her fascinator and vintage styling. My friend Stella Panagiotidis (Instagram here), a RED model, introduced me to both my seat mates, Tanya and Nick. I met Stella when I styled her for a fashion show put on by My Sister’s Closet eco thrift boutique as part of a fundraising gala for Vancouver’s Battered Women’s Shelter Services. You can read about that on my personal style blog here. Another model I styled in that show, Marc Swiednicki, was also modeling in RED. It was great seeing them both on the runway again. Below: Chris Witt and Sean Malmas. I particularly loved all of Chris’s metallic silver, the studded kilt, and that shimmering blue peak on top. Below: Byran Henson and Dailey Dass. I quickly clocked Dailey’s suit as an Oppo. I adore their bold, playful designs and would like one myself. Byran’s humongous houndstooth pants and hat have no trouble holding their own. Below: Stephen Wahl, Barry Dumka, Ian Clarke. These guys just seemed to be having a great time. And that’s my report. I seem to be attending more media events. I named this blog Culture Serf because I had originally intended to cover cultural events in the city as well as street style. It looks like it might finally be happening. Heh.